Advertisers can take advantage of DirectCPV’s CPV, PPV contextual advertising network to increase sales and leads while boosting brand awareness. We have plenty of US and International traffic to ensure that advertisers recieve quality traffic. Ads are displayed either via a popup ad or interstitial ad. Campaigns can be set up to target URLs or keywords, or location. Another affordable option is Run of Network (RON). Our account managers work hard to ensure that advertisers generate the highest ROI possible. Our CPV bidding system begins at just $0.004 USD to help advertisers target customers at a cost-effective rate. Bid on target keywords to ensure that your ad campaign is focused to reach a desired customer base. Get cheap traffic to get your brand out there! Our affiliates have over 12 million opt-in users to help dramatically increase your ROI and brand awareness. Our CPV bidding system begins at just $0.004 USD to help reach customers at a cost-effective rate. Bid on target keywords to ensure that your ad campaign is focused to reach a desired customer base. 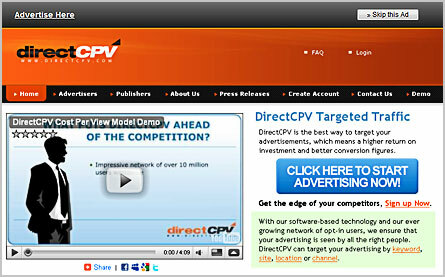 DirectCPV has created the best ad tools in the business. Our keyword and URL suggestion tools and competition analyzing software are great to gather those hard to find targets. Advertisers are assigned a personal account manager to help find new targets, answer questions, provide technical support or deal with funding issues. Click here to Start Advertising with DirectCPV.